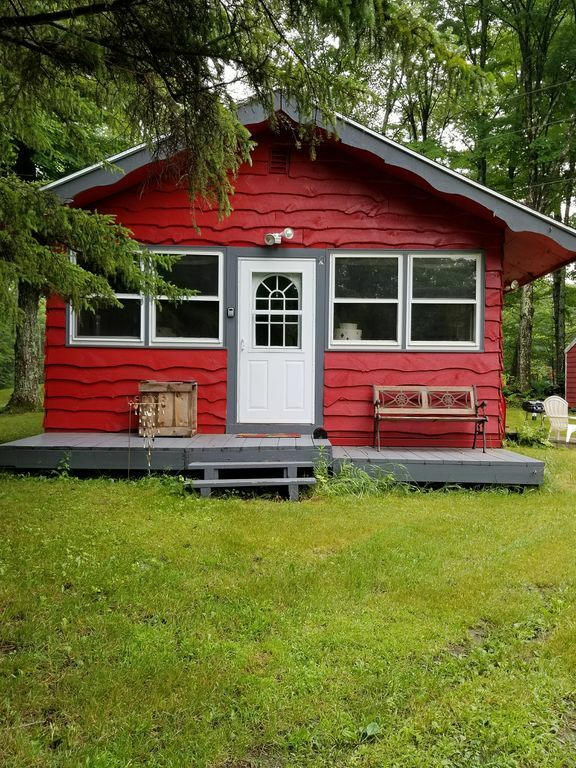 Our two bedroom one bath cabin got a refreshing renovation! Super comfy bedrooms with expansive family style living space. The beautiful woodstove will keep you warm and chances are you'll cozy up! Bring your comfiest slippers to really get into a relaxed vaca vibe! Located on 5 acres in Cavendish, you're only 15 minutes from Okemo but get the authentic Vermont experience.Perfect for a family of four and we welcome groups of four with a queen and bunk beds. WiFi and a smart TV are at the ready and we encourage you to take in the atmosphere and natural beauty. As it may not be obvious, the brand new couches do recline for extra comfort! The drive to Okemo affords you beautiful views of the mountain on scenic back roads. Less than 1/4 mile from VAST trails. We find it enchanting every day! In the summer we are closely situated to lakes, hiking, biking, golf, live music, breweries! All the things that make Vermont so beautiful, adventurous and relaxing! We absolutely loved the cabin. The wood stove made for a cozy place to rest after a day of skiing. Easy access to Okemo. We also drove to Stowe one day- about a 2hour drive- for some amazing skiing. We loved how secluded the area around the cabin felt. We would also recommend Singleton’s Store just a few miles away for some great local Vermont treats and an awesome meat section. It worked well for all of our needs. Thank you for a wonderful stay. We hope to return! It was absolutely the most amazing stay and relaxing experience I’ve ever had ! Absolutely wonderfu! This little cabin a absolute must go if your looking for a place to relax and make wonderful memories away from home ! Enjoy the fresh air of the beautiful Vermont Mountains and the comfort of a wood fire crackling with a cup of tea. The atmosphere of the cabin is so well put together right down to the handmade pine cone fire starters and soft fuzzy blankets. Well written (and charismatic, prompting a good laugh) notes left by the home owners on how to start the woodstove if wanted or where to leave the trash, even detailing good places to eat nearby for ease of mind. Such nice and considerate hostess are the owners that you’ll want to return time and again! Thank you for the wonderful stay! We rented this home for a ski weekend at Okemo, only 10-15 minutes drive from the house. The home was clean upon arrival, and we were surprised at how large the living area was - it looks small from the outside but it was more then spacious enough for 4 adults to sprawl out on the couches after a long day on the slopes. Ample firewood was provided for the wood burning stove which kept the home nice and toasty on one of the nights when we dealt with subzero temperatures. Everything you need to have a comfortable weekend is there. Only thing we wished was included was a microwave - we had some thanksgiving leftovers and had to improvise and heat them up using the stove! Definitely felt at home and I would absolutely rent this property again. Excellent little cabin for my family of 4. Small cute and functional. Very cozy. We enjoyed our visit. Nearby towns had good restaurants. Strongly recommend if you come to VT to visit. Great cabin for our weekend stay! Clean cabin with everything you may need. What a nice surprise! Perfect size for the two of us. Relaxing living area. Nice kitchen with counter for eating. Bathroom small but fine for our short stay. Near lots of restaurants and shopping but nowhere near the hustle and bustle of vacationers!